Over the past couple of weeks, there has been some rumblings about the status of the Disney Infinity PC release, which I purposely chose not to discuss as I didn’t want to start a fire if there wasn’t one to be had. Unfortunately it became clear the past 24 hours, that it is as bad as people have feared. The PC release always felt like a bit “different”. It was a different kind of release, even from the eventual mobile releases. 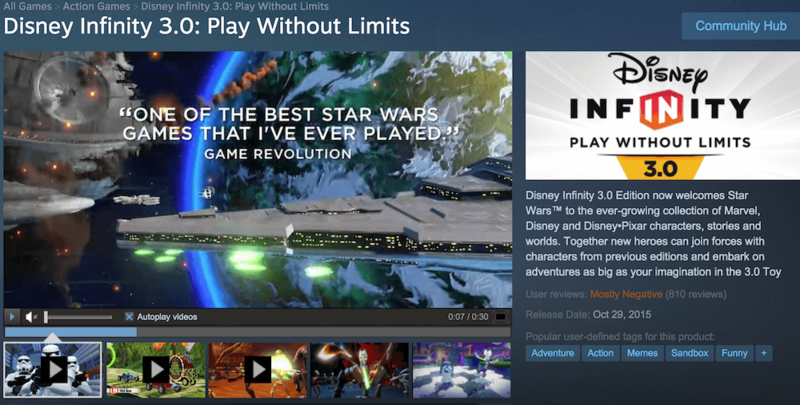 But it still was relatively popular, with some being their main (or even only) access to the Disney Infinity game. But now it looks like development has hid a major stop sign. Nick and Judy are currently not available on the PC. We are continuing to evaluate which content will be a good fit for each platform. I apologize to frustrated PC players. Bigger Picture stuff I do not control. I appreciate all your support. Can't say much more then I have. Everything we do is to make the game better, if some stuff can't make it to all platforms there is a benefit to another part of the game. So that seems to be a pretty big hit to the PC releases. If this was just Battlegrounds by itself, I could somewhat understand. Battlegrounds was a huge undertaking with numerous changes to the play style, so perhaps that didn’t mesh well to their PC platform. But not even having Nick or Judy? That doesn’t bode well for any future release. Thankfully they are doing something to help those with figures that aren’t supposed on the PC platform. If you’ve been following the PC release closely at all, you know it’s been marred with problems from the beginning. Delayed release, performance issues, unkept promises, etc. Just take a few minutes and read the reviews of the PC release, and you’ll get a better understanding. It’s 100% understandable to be upset from a PC player’s standpoint, even from the beginning. The general marketing has been console and PC versions are exactly the same. But if you’ve played the PC version, you know that’s not true. While many of you console players have been upset about not being able to play online in the Play Sets, PC players haven’t been able to play multiplayer in ANY mode. Unfortunately I think it was just a lot of mix messages for what they were offering/trying to achieve from the PC release. I do hope they come back to the PC platform, but hopefully this time with a clearer explanation from the start what to expect from the PC release.